I drink wine every single day. I added chopped cranberries, too. 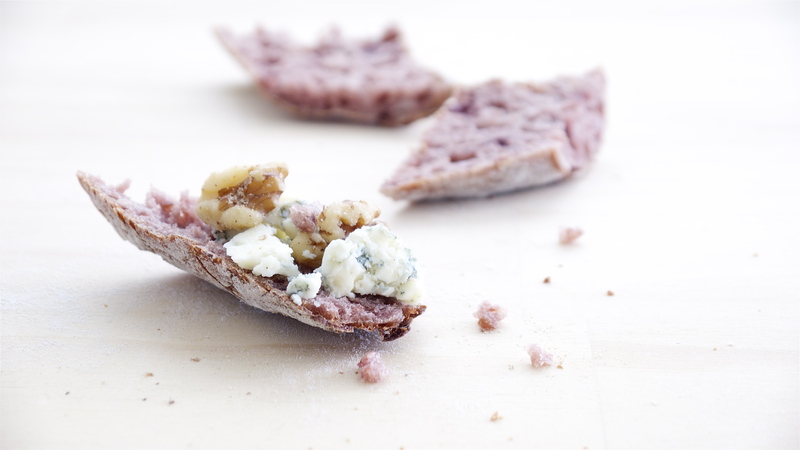 Thanks to wine and cranberry, it has a nice sweet and tangy flavor and definitely goes well with blue cheese! I can't stop drinking & eating wine! In a bowl, mix flour and Wine + Water roughly, cover it with plastic and Autolyse for 12 hours in the fridge. Add Sourdough starter and mix by folding dough in the bowl. Add chopped Cranberries and mix by folding dough in the bowl. Add Salt and Slap & Fold for 3 - 4 minutes or until the dough becomes a ball. Bulk fermentation at room temperature, 1 sets Stretch & Fold (1 set = right over left, left over right, bottom over the top, top over bottom) every half hour until enough strength has been developed. Let it rise until the dough starts showing the 'activity' and becomes about a third in size. It takes about 6 hours total in winter time (it depends on the season) in my kitchen. Put it in the fridge for 16 – 18 hours. Pull it out of the fridge and leave it out for 1 hour. Divide into 2 equal parts and preshape the dough. Let it rest for 15 - 30 minutes. Shape into baguettes / batards and place onto a floured couche, seam-side up. Final fermentation for 45 minutes - 1 hour. 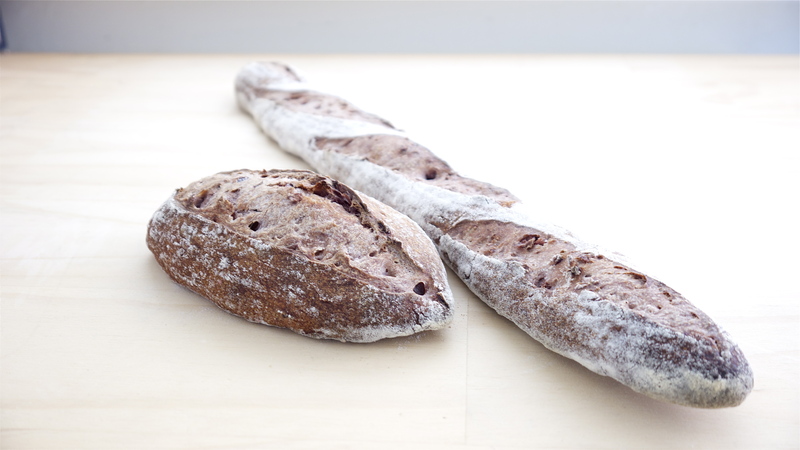 Score the top of the baguettes / batards using a lame or a sharp, serrated knife. Place the bread in the preheated oven, pour the water onto the brick blocks and shut the oven door immediately. Turn down the oven to 480°F, bake the bread around 20 minutes. Let them cool onto a rack. * The time and temperature will be changed depends on the season. What a gorgeous blushing crumb! How much of the wine flavor comes through in the bread? Beautiful! I made a similar bread but used a white wine instead. Very nice photography as well. Thank you for sharing your wine bread! I would definitely try it and let you know! Seriously though, Did you actually bake with Chateauneuf de Pape? That makes my head explode. I'm sure it'd be good but I'm much too frugal to do that. Yes, I did! Hahaha... It was too generous, wasn't it? I went to a liquor in my neighborhood to get a birthday gift for my friend the other day and if you got one bottle, the second one was just 5¢!!! I can't do this anymore though... ;-) I just prepared another sourdough red wine bread with yellow tail :-) Hope it'll come out good. Wow... 5¢ is quite a bargain! Wine is much more expensive in BC than it is in Oregon, which is still more expensive than California. A $5-7 bottle of table wine in California is probably $8-9 in Oregon and $12-15 here. But, yes, Yellow Tail is closer to my budget for non-special occasion wine and something I'd bake or cook with. I hope it comes out well again this time. Would you mind if I featured this on the homepage for a bit? It really is creative, and that color is eye catching. recent BevMo twice a year promotion to buy one and get the 2nd for 5 cents. Love that special deal and sad it only comes around 2 times a year. Nothing like it. 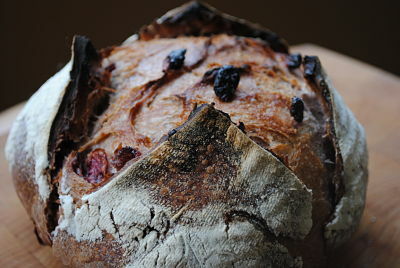 The red wine and cranberries have contributed a gorgeous color to this bread. The taste must be delicious. Your breads are interesting, and beautiful! I am adding this to my favorites - I really love what you've made! 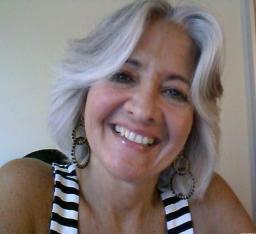 Your kind words made me happy!!! I can't stop smiling. Thank you! Or do you do a full undisturbed 6 hours fermentation after folding cycles? 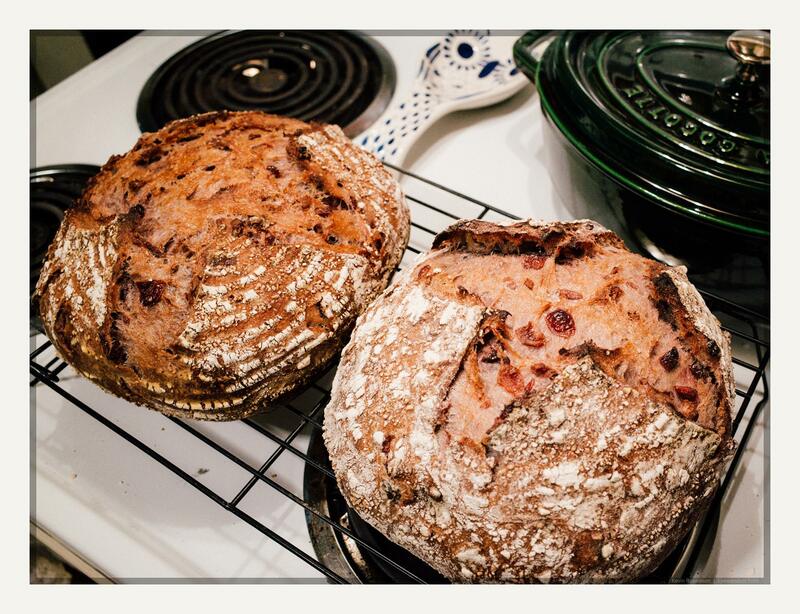 Just refreshed my starter and it's looking good for this weekend baking adventure! The last pictured bite with walnut and bleu cheese! Yuko, you made the "cover" congratulations! ...it's happy dance time... ...that's a ✮✮✮✮ häpchen! This is truly gorgeous sounding, I am salivating at your pictures! Definitely one I plan to try in the future! Chateau neuf is 40 bucks a bottle here in beautiful overtaxed overpriced British Columbia!!! Another interesting masterpiece. Do you plan to try this in your Donabe (in a different shape, of course)? My shaped bread is in its final hour rise before baking... I am afraid something is not right, though. I will post after it bakes, but my dough is acting almost as if the wine killed or interfered very negatively with the starter - there's little to no sign of fermentation. I wonder about the addition of sulfites to the red wine to preserve it and if some batches might have higher amounts? The sourdough starter should be very active because we use wine (which is acidic) for this bread. I hope your red wine bread will turn out well, too!!! Well, it turned out better than I expected - the bread stayed over 2 hours at room temperature, but I still did not see any "signs of life"
I'll get some blue cheese, perhaps a good Roquefort, and I am sure they will love it! here is a photo I intend to blog about it in a week or two, and of course you will get all the credit, and I'll link to your post here! Whenever I use alcohol in my breads it does seem to a slightly more dense loaf unless you mix it with a fair amount of water. Yours looks like you still got a fairly nice open crumb and your bread opened up like a seed pod which is beautiful! 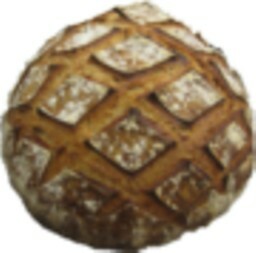 Your bread looks amazing! How was the taste??? I hope it was good and you liked it! Thank you so much for sharing your experiment! I really appreciate it! the bread is sweet and savory at the same time - toasted with a tiny spread of butter is enough to make you shed tears of joy. Loved it! Please keep posting your tweaks and adventures! Yes, I definitely will post my tweaks if there are any changes! I visited your blog and it was amazing! 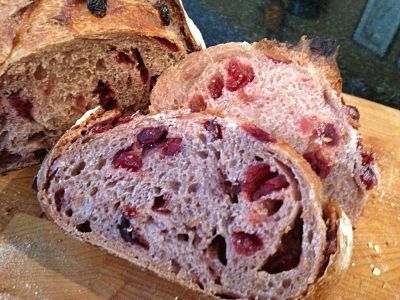 I am very happy you like the red wine bread :-) Also, your organic wine experiment will be very informative and interesting! I am looking forward to seeing your post about it! Stupid me....I didn't follow my own advice to you and used too much wine in my attempt and the dough ended up underdeveloped with a gummy inside. To make matters worse I used a dessert wine which I forgot how much I spent on it and my wife reminded me it was almost $30! I'm glad yours came out very nice and hope to hear about your experiment before I take another stab at it myself.. I've been lurking on this lovely forum for a couple years, but this particular recipe caused me to finally sign up a couple weeks ago, and comment today. I've baked yeast loaf-pan breads for 20 years of many kinds, but in the past few months have finally gotten into artisan style loaves. This one is incredible, truly, and very adaptable. It's worth the 2.5 days to complete easily. I just had to comment on it even though it's been here for quite some time. In fact, this morning I began a tripled recipe with some added chopped walnut, so that I can make two small boules to give out to my family. Bravo on this one. Just excellent. I tripled the recipe added a bit of finely chopped walnut (just 70g total which was perfect for an occasional walnut surprise) and retarded the proof in the fridge. way longer primary fermentation as well and not quite as much hydration- gave me a much better spring. This turned out even far better than my first go with this recipe, if that was possible. The left is the seam-side up boule, the right side is seam side down, both cross-scored. I let the one take a darker crust since it'll be eaten last. For this loaf I think I prefer the the seam-side down, clean scored look.... But whatever. Seam-side up gave me more spring because of the added tension on the exterior of the dough-ball. The seams break apart sooner when they are facing upward because the gluten structure isn't as strong or as uniform, so you really don't need to score the loaf, but how it breaks at the crust will be a mystery to you until it bakes... Next time I'll do it a combo of all three... Seam-side down, double-hatch score parallel, and take the crust darker. So many variables. All of them delicious. oh, and I also substituted just a bit of rye flour for the AP flour (around 100g total in my tripled bake) and added a tiny pinch of instant yeast to the near the end of the autolyse, before the levain was added.